Liz - We know that our memory and our cognition declines as we age and this is just a normal thing that happens. But there is a lot of factors that can help prevent that or at least slow it. We know things like exercise or even dietary restriction can help slow this decline in memory function. And there's a lot of evidence in humans that having lots of friends, lots of social contacts, can also slow this decline. But in humans it's hard to tell if having more friends prevents memory decline, or if people who have declining memory tend to withdraw from their friends. We can't figure out which is causing what. So I set out to determine this in animals, where we can do things like control how many social contacts an animal has. Chris - And which animals were you looking at? Liz - We used normal adult aging mice. Chris - But mice don't traditionally go into care homes or go to church singing choirs or join orchestras and things. 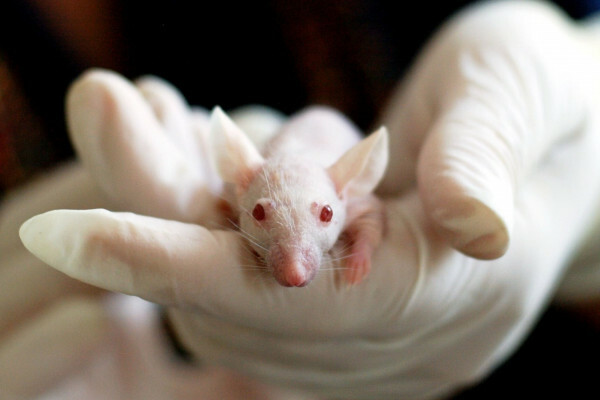 So how do you actually do the experiments so that you get something meaningful from the mice? Liz - With mice we can essentially control how many roommates they have. They can live with, in our case, we put them in pairs, two mice. So that's our low level of social contact; our “old couples”. Or they can live in large groups. And in this case we put seven mice in a cage, so they have sort of a larger community. At the end of three months living either in small group pairs or the large groups (7 mice per cage), we measured their memory function, and in particular, we measured memory that depends on a brain area called the hippocampus. The hippocampus is incredibly important for forming new memories, and it's the area of your brain that deteriorates probably the most with age and definitely very prominently with Alzheimer's disease. Chris - And you think these memory tasks that you set for the mice are a reasonable proxy for how a human would perform? Liz - Everything we know about these memory tasks in mice versus humans suggests that they're testing very similar parts of the brain. With mice that particular task that we used was called a “novel object placement task”. The mice were put into an arena with two objects and they got to get to know those objects, explore them. They were taken out of the arena and then after a delay they were put back in it. The same two objects were there but one of them had moved. Mice prefer to spend time and investigate things that they think are different. So if they remember the two objects, they should spend a lot of time with the moved object. But if they don't remember the objects, then they'll spend about the same amount of time with them. And what we found is the group-housed mice showed much better memory for the object that moved in our memory task than the pair-housed mice. Chris - And was that born out neuroanatomically? So in other words, if we go and look now in the brains of these animals can you see changes or differences that would be consistent with those behavioral differences? Liz - What we saw when we looked at the brains of these mice was that the group-housed mice had less signs of what we call neuroinflammation. This is inflammation just like when you get sick, your immune system inflames. Your brain also shows signs like this. And this is something that happens commonly with aging and people believe this is part of what causes your brain not to function as well. When we looked at the brains of group-housed mice, they had less of this neuroinflammation compared to the pair-housed mice. Chris - So what do you think that is? Why should hanging around with a big group of your friends make you have less inflamed brain and therefore show less brain attrition as you age? Liz - There are a lot of theories. One of them just has to do with how hard it is to deal with other people, or in this case other mice. If you can imagine dealing with people everyday, takes a huge amount of cognitive load. It puts a huge stress on your brain. You have to figure out what they want, what you want, what you think they think you want. And a lot of people think that this cognitive load is a mental exercise and that's what helps keep your brain healthy. Chris - Could it not be though that if you're in a big group of animals, you perceive a bit of a challenge? You might think “I better keep active because I want to go and eat and someone else might steal my lunch.” It may also be that you're running around more. We know that exercise is very good for the brain. There's whole lot of other factors that could explain this, though, aren’t there? Liz - There are other factors. So, exercise is a possibility. We looked into that as best we could with our mice and we didn't see any signs that they were getting more exercise. For example, they weren't any trimmer. They all showed a relatively portly aged figure. Exercise would tend to decrease their body weight just like it would in humans. We looked for other signs such as better activity, moving around more in our behavioral tasks, and we didn't see anything like that. Chris - And what about sort of extrapolating this to humans? What do you think the takeaway message for aged humans, or aging humans should be from what you're finding here? Liz - There certainly isn't any harm from thinking about your social contacts as you age. If you're making a choice as you age about where you live, for example, all the human evidence points to there being a positive correlation between having more contacts and preserving your cognitive function. And now our study suggests that this really actually might be causative; you actually having more contacts actively protects your brain. So if you're making a choice about where to live, try to choose a living situation where you'll be able to maintain contact, even for example as your mobility decreases or as you can't drive anymore. Chris - So a retirement village rather than a retirement hermitage. Liz - Yes, that’s a great way to put it: a retirement village, or a retirement community.